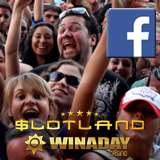 This week Slotland and WinADay Casino are celebrating major social media milestones. Both of the unique online casinos have seen a steady increase in activity on their Facebook pages in recent months and this week they’re each commemorating Facebook population explosions as their Followers reach record numbers. Thousands of players check the casinos’ Facebook pages regularly for special bonus offers and trivia contests awarding freebies. They also enjoy sharing their casino experiences with other players. Click here for Slotland's Facebook page. Click here for WinADay's Facebook page. "For many players, interacting with other players on our Facebook pages has become a regular part of their casino experience," said casino manager Michael Hilary. "We do lots of contests and announce lots of special bonus offers on Facebook so it’s definitely worthwhile to check in periodically!" Both casinos are offering special bonuses this weekend. Bonus codes must be entered before making a deposit. All bonuses are available until Sunday, August 14th only.